Day camps are even more unique than our overnight camps. 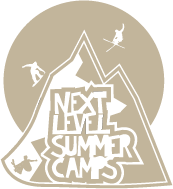 These are summer camps for elementary-aged children that have never learned to ski/snowboard before or need a little help improving their basic skills. Our talented coaches have a lot of experience working with beginners in this age group and know what it takes to motivate, teach, and help them progress. We start off early because the morning is the coolest time of the day! During this session, our coaches ride with the campers on both the bunny slope and the main slope (depending on comfort/ability levels). Lunch is provided by us and will vary from hotdogs and burgers, to cold subs/hoagies, to the classic PB&J. If your camper has a food allergy please notify our directors as soon as possible by emailing summercamps@liberty.edu and we will accomodate him/her. Afternoon activities normally consist of a visit to the Lahaye Rec and Fit Centers. Campers will be able to choose between challenging themselves at the rock wall or cooling off in the pool. There will be qualified lifeguards and supervisors at these facilities along with our Next Level coaching staff. Once we arrive back at LMSC campers have the option to ski/snowboard again or watch a movie in the upstairs portion of the Barrick-Falwell Lodge. We will also have the trampoline and tubing runs open for campers.